I ventured behind the "Orange Curtain" on Sunday and stopped at Westminster for lunch and dinner in between a day of successful shopping. Vietnamese food is perfect on a very warm 82 degree day in Southern California; it's light, refreshing and satisfies all your taste buds. Pho Dac Biet - strong, full-flavored broth with tender rare beef, well-cooked beef and tripe. The tendons could have been softer but otherwise this fully satisfies all my Pho cravings. Ahhh. I will take a banh mi over a hamburger any day. This ham, meatloaf and head cheese sandwich went along perfectly with the creamy pate and crisp, light baguette. A lot of people eat this with cilantro, cucumbers and jalapenos but I always leave those out on my banh mi. The Vietnamese really took the best from the French and made it even better! If Charlie, one of my best friends who migrated to Portland recently, had been with me on this eating "tour," he probably would cry from happiness. He's the one who introduced me to Brodard. 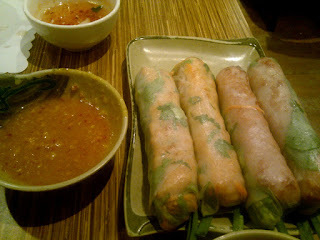 These pork (nem nuong) and shrimp (chao tom) spring rolls are legendary at Brodard and for good reason. The pork meatloaf and shrimp paste are wrapped in a delicate rice paper with herbs, cucumber and a crunchy piece of eggroll skin. Dip the roll in the house special fish sauce and you'll be in heaven. Everyone who goes to Brodard orders these rolls. Don't miss out. This is a pan-fried rice flour "crepe" appetizer. 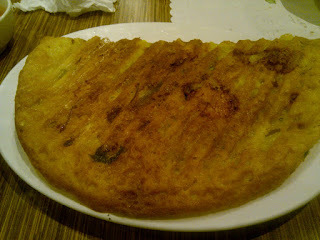 It is chock-full of bean sprouts and onions with a sprinkling of shrimp and shredded pork. It's also flavored with coconut milk and the crepe is served with lettuce which you use to wrap pieces of the crepe and then dip in the accompanying lime chili fish sauce. Like most Vietnamese food, this tastes flavorful and "light" even though its pan-fried with oil. 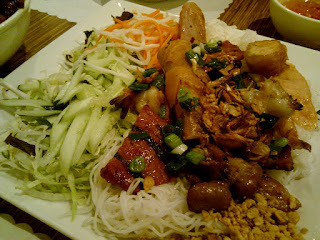 This main entree is under the Vermicelli section. Cooked vermicelli is served with grilled chicken, grilled pork, grilled & fried shrimp paste and a crispy egg roll. Plenty of greens, peanuts and the lime chili fish sauce make this a delicious and refreshing entree. 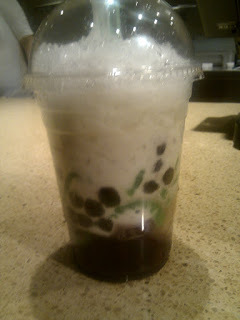 This is what I crave on a warm SoCal day. 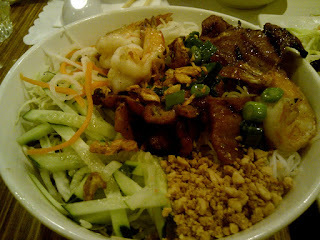 This entree is also under the Vermicelli section. It's a more pared down version of the Dac Biet (that means "special" in Vietnamese) entree above. It has only grilled shrimp and BBQ pork over vermicelli, fresh, crunchy greens, peanuts, roasted shallots and of course, lime chili fish sauce. 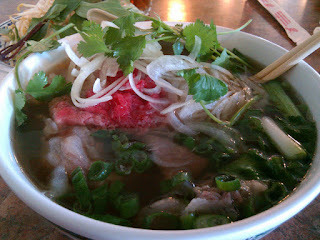 All three places I went to were hopping with customers but the wait at Pho Kimmy and Brodard was only a few minutes. 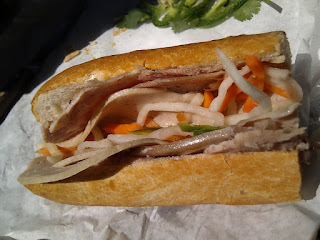 Bahn Mi was a little more chaotic. The bakery was overrun with people trying to order sandwiches and various sweet and savory Vietnamese goodies to-go. There's no line or number system so you just have to be a little more aggressive in getting one of the servers' attention. All in all it was a wonderful day in the OC. I satisfied my cravings for all my favorite Vietnamese foods and enjoyed ocean views while I was shopping. Energy burned at the gym in the early morning and during shopping balanced all the delicious food I ate too. **There's a fancier location called Brodard Chateau. I've never been but I've been advised by friends that the food at this fancier location is not as good. brodards is still one of the best places for nem nuong for sure! I friggin love che ba mau and I really don't know why. It's a new thing. Maybe it's cuz we're in America? and the color (except for the green) reminds me of the flag? No clue. Sublime Food Lounge Is Absolutely Divine!